"Never underestimate the power of a natural bond." So what did we get this week? A not-so-good Monster of the Week, strike one. Improbable set-up in the woods, strike two. Distinct lack of Ichabod Crane, strike three. Shows with a supernatural theme are, by their very nature, improbable. That's why there has to be a reason for the craziness, like a Hellmouth, or a calling. Incidents from Ichabod's long ago past relating to the Founding Fathers work on this show; incidents related to our two active villains also make story sense. But this time, Abbie, Sophie and Danny simply stumbled over a monster in the woods during an FBI training exercise. An exercise in which they were forced to give up their cell phones. It felt contrived because it was contrived. To make it even worse, Abbie, Danny and Sophie stumble over an abandoned cabin, Sophie decides to tear up the floorboards, and she finds a journal that (1) explains what the wormy white monster is (a Verslunder. Kesundheit) and why it was in the well, and (2) gives them a relatively easy way to take it down. Coincidental beyond belief. If there was a story-related purpose to this particular jaunt in the woods, it should have been to bring Danny Reynolds into the Sleepy Hollow Scooby Gang fold. But no. We got to the end of the episode, and Danny was still in the dark. How could he not notice Abbie and Sophie fighting a monster in his vicinity? Not only that, Danny accused Abbie of being selfish when she is the furthest thing from. He knows nothing about the real Abbie. I don't understand why the Abbie/Danny relationship is still a thing at all. 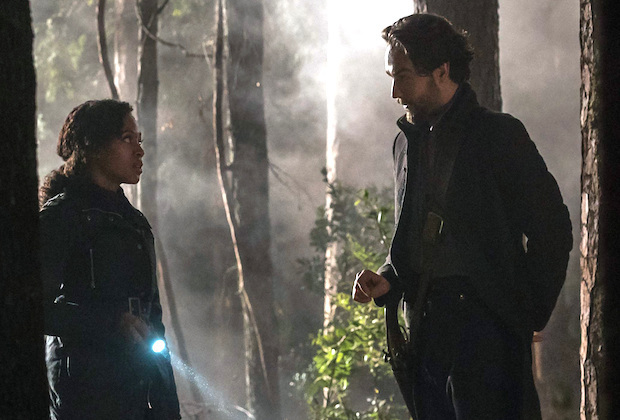 It exists to give Abbie a love interest who is not Ichabod. And it doesn't work. At all. 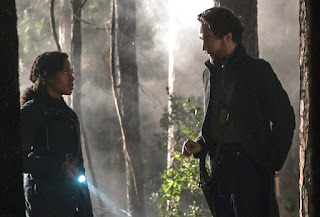 Ichabod Crane and his relationship with Abbie Mills is why I watch this show, and this episode, sadly, gave us minimal Ichabod. I'm going to skip past the coincidence of Ichabod taking the Witness tablet along on his interview with Professor Cranston in Rochester, and admit that the best thing about this episode was their discovery that the symbol isn't evil at all — it breaks into two pieces, mimicking the Witnesses as a pair, and so does the Witness tablet. It even makes a bit of sense, since Abbie was convinced the symbol had saved her, and she was indeed saved by Ichabod as well as herself. The Jenny-and-Joe segment was actually combined with the Pandora-and-Hidden segment this time. But Joe is still Wendigo-guy? That's sad. Or is it convenient? If Joe can control it, will that give him some power to fight Pandora and the Hidden One? -- I liked the Abbie and Jenny rock-climbing bit at the beginning. I always like Abbie and Jenny bonding scenes. -- Sophie, who made me smile a couple of times in this episode, told Abbie that she wanted to believe in the supernatural because her parents disappeared under weird circumstances. Bet we hear about that again. -- Our flashback was to 1650 this time, which meant no Betsy Ross. Are the producers finally registering that Betsy Ross doesn't work for us? Abbie: "Crane has been helping me through some behavior modification techniques, or as he's insists on calling it, a diet of the mind." Abbie: "No. A Beautiful Mind. I never should have gotten him a Netflix subscription." Ichabod: "Careful with this one. This caused the great fire of Chicago. And Krakatoa." Ichabod: "Very well, I shall to Rochester alone. You know what? I knew Colonel Rochester. Peevish sort. I was surprised they named a city after him. He hardly deserves that honor." Abbie: "You haven't seen Rochester." Ichabod: "The answer to this might be self-evident, but how was your survival exercise?" Boring episode. Well at least no Betsy. I want more Ichabbie. Sigh. Well at least Pandora is rebelling. Right?